Have you ever watched a TV show or a movie and had that make you crave something particular to eat? Well, that’s what happened after we watched Wong Kar-Wai’s “In The Mood For Love”. It’s a beautifully sensuous movie, not about food, but the lead characters were always running out for noodles. And it totally forced us to want to eat noodles! We drove over to Washington Ave since it was close and just decided to wing it. We ended up deciding on Wokano, a fairly new chinese restaurant. The place is huge, and I believe they have karaoke rooms on the second floor. The main dining area is big and bright with horribly gawdy chandeliers. They have a decent sized menu, but from what I could deduce, it was definitely one of those places with a secret chinese menu. 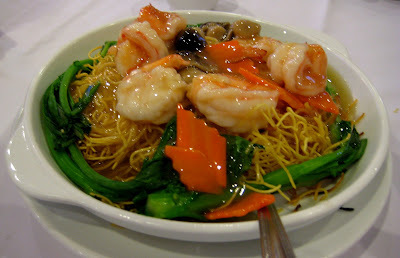 Well, noodles were what was on the mind so we got a shrimp pan fried noodle. Pan fried noodle isn’t something I usually eat. There’s something about the idea of a crispy noodle dish. I prefer my noodles noodle-y. But this was a nice dish. The sauce is mild but the noodles had a nice smoky flavor, with just enough burnt taste. I’m one of those people who like things that taste a little burnt. Weird, I know. 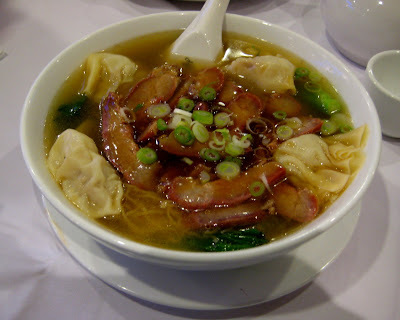 I wanted a bunch of noodles in soup so I got a noodle soup dish with barbecued pork and dumplings. The dumplings were big and quite meaty. They were probably a bit too meaty for me, I prefer a more even ratio of meat to vegetables. The pork was excellent. The broth was a bit on the bland side, but I did not mind it one bit. The dishes were also quite affordable. Our first server was a surly lady who looked miserable. Eventually, we got a different one and he was much more jolly. It was a perfectly acceptable meal. It was nothing extraordinary but it certainly satisfied our noodle cravings! Go for the dim sum. It easily beats any dim sum restaurant in Chinatown. Trust me ‘cos we have had authentic dim sum in Hong Kong and Wokano is comparable to what you get in HK. Whoa! There’s a chain of Asian fusions restos in CA called Wokcano too. I don’t think they’re related though. I’ll be posting my review shortly ;-) Happy New Year! Delicious! Loved ‘In The Mood For Love’ too.